Habit: Plant 8--35 cm, not fleshy. Leaf: oblong to (ob)lanceolate, generally flat, entire or finely toothed; base tapered. Inflorescence: open, densely glandular; bracts > 2 mm; pedicels 2--5 per node, > calyx, spreading to ascending in fruit. 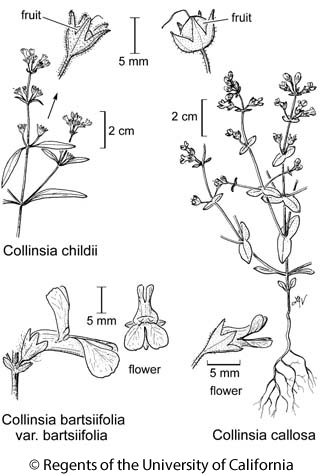 Flower: calyx > fruit, in fruit < 5 mm wide, base rounded, lobes spreading, tips +- blunt; corolla 6--9(11) mm, +- white or pale lavender, upper lip +- = lower; filaments glabrous, basal spur 0. Seed: 2, +- 3 mm. Citation for this treatment: Michael S. Park & Elizabeth Chase Neese 2012, Collinsia childii, in Jepson Flora Project (eds.) Jepson eFlora, http://ucjeps.berkeley.edu/eflora/eflora_display.php?tid=19990, accessed on April 25, 2019.
c&s SNH, Teh, SCoRO, TR, PR. Markers link to CCH specimen records. Yellow markers indicate records that may provide evidence for eFlora range revision or may have georeferencing or identification issues. Purple markers indicate specimens collected from a garden, greenhouse, or other non-wild location.